Bu bölümde öğrenciler anlayamadıkları bölümleri daha iyi kavrayabilmek için kılavuz niteliğinde hazırlanmıştır. Konuyu daha iyi kavrayabilmek için buradan öğrendiklerinizle kendinizde çözmeye farklı örnekler yapmaya çalışınız. Öğrenci cevaplarını birebir kopyalamayınız. Buradaki 8. sınıf ingilizce teen life ders kitabı cevapları ve çözümleri sizin için derslerinize büyük katkı sağlayacak eksiklerinizi giderebileceksiniz. # 1. Match the meanings with the words. Then describe the women’s clothing in the photos. # 2. Complete the sentences with the words in Activity 1. 2) Don’t be such a snob! 4) She spends a lot of money on clothes because she likes being trendy . 5) Look at that woman! She is very impressive! 6) He was a real nerd in high school. I don’t believe he’s so handsome now. 7) I’ve got a cowboy outfit for the fancy dress party. # 3. Listen and repeat the words. Then look up their meanings in your dictionary. # 4. 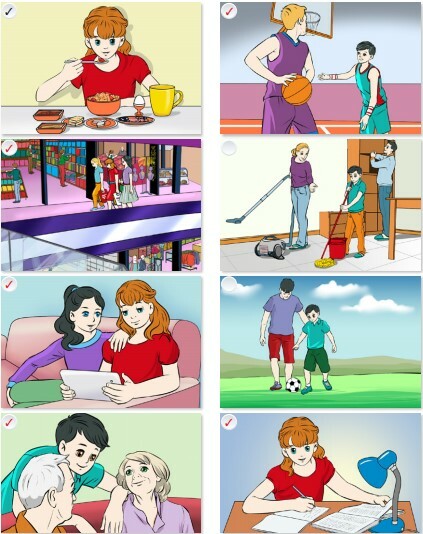 Write the words in Activity 3 under the photos below. 1) What do you think of the clothing in picture A? 2) I think they look ridiculous. I prefer wearing casual clothes. 3) I think they are very pretty and impressive. I like to be different. # 1. Look at the pictures. Which of the activities in the pictures do Ayşe and Mark do on Sundays? Listen and read. Find the other activities. # 2. Read the personal narratives and complete the table. # 3. What is your favourite day? What do you do? Complete the table, as in Activity 2. # 1. Look at the title, the headings and the photos. What would you like to know about British teenagers’ family life, school life and free time? Ask a question for each category. # 2. Listen and write the expressions under the correct headings in the table. # 4. Make notes about teenagers’ family life, school life and free time in your country. Use your notes to write a short paragraph. # 1. Listen and read the dialogue. Then work in pairs and make a similar dialogue about the actions you regularly do. # 3. Give a simple description of your daily routine. Use the phrases below. You can also use your own ideas. # 5. Work in pairs. Ask and answer about the activities in the chart. Use How often…? Complete the second column of the chart. # 6. Tell the class about yourself and your friend. # 3. Complete the text with the verbs in the boxes. My name’s Jim. I 1) live with my family in Montreal, a city in Canada. I’m thirteen and I 2) go to middle school. My best friends are Mike and Emily. On school days, I 3) get up at seven o’clock. My parents and I 4) have breakfast together. At eight o’clock, Emily and I 5) ride our bicycles to school. Mike’s house is close to school, so he 6) walks . After school, Mike and I often 7) play football. Emily is crazy about tennis. She’s in the school tennis club and she 8) practises tennis every day. In the evening, my parents and I usually 9) watch TV together.